FoodMastery: Our mission is to promote health, long life, and happiness, through sharing nutrition and fitness information around the world. All organic vegetables should be fully immersed in water, agitated to shake off the dirt, and then rinsed off before being sent through the juice machine. 2x is usually best for optimal cleaning. You don’t want dirt between your teeth, do you? Additionally, watch the 13-minute Chuck Bauer Juicing YouTube Video while reading this instructional sheet. Do NOT buy salad spinach. Most of the time, your organic spinach will have stems that are as thick as your pinkie finger. The stems are where the majority of the enzyme & alkalinizing horsepower is. The spinach should be run through the juice machine first—if it hangs up, then push through with a celery stalk. Popeye was RIGHT! When in doubt, do 6-to-8 bunches of celery! Lots of illness prevention is built in to those stalks. 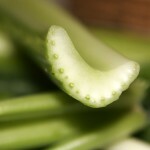 Before you run the celery through the juice machine—after cleaning of course—cut the stalks in halves. Only then run 2-to-3 through the juicer at a time as to not clog up the machine. You can cut off the very bottom of the stalks and toss that away. STOP HERE. Turn machine off – unplug it. Do a QUICK tear down: clean out the top of the machine (have a waste basket or compose basket near by) and the spinner dish. Reinsert and finish off your run of juice! 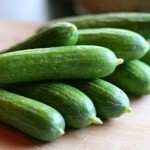 No need to peel—easily break the cucumber in two and insert one half at a time into the juice machine. Load of nourishing cucumber water here! Remember the strainer!!! These are easy—break in two with your hands and insert 2-to-3 pieces at a time! DO NOT TRIM off the green leafy head—that is where your enzyme horsepower lives. Rabbits really only eat the green leafs—they know something we don’t! Don’t go without your green juice when travelling or in a food pinch! Love the green juice. Now hubby is saying, “where’s mine!” Instead of, “no thanks”. I have tried the champion 2000+…it heated up the juice. Then tried the Huram…it was okay because it was slow speed, but so much of the veggies was left in the single auger. I now have the twin gear masticatin GREEN STAR juicer and it is wonderful. Do some research on it….you’ll love it too. Hello Mary Ann – thanks for these comments. The Green Star is a fav of many and does a wonderful job. One slight challenge with the Green Star and others like it is the time it takes to do a gallon of juice. Perfect for low volumes of juice. Higher volume juicing people might be better off with the Jack LaLanne or the Breville. In the summer time when rinsing off the veggies for juicing, I add ICE to my water when agitating the vegetables for cleaning. The ice keeps the veggies cold and they run through the juice machine better than if they were warm from warm water. Hope this helps. This is a huge amount if juice! How do you keep it stored? Wendy – one of the challenges with juicing is that people will juice 8 ounces then have a big cleanup of the machine that takes about 10 minutes. So, after a few times they get lazy then stop juicing all together. The best way is to do a large juice run and keep it in sealable glass containers for up to four days (juice will stay good for four days). Place this in a google search: Glass Sealable Containers Plus, check out my photo page which containes a few photos of the fridge w/ glass containers full of Bauer Power Green Juice and my green juice / BEETS added in! Wendy, you can preserve the nutrients in your juice by adding lemon and or vitamin c powder. I use both. To prove it to yourself ( as I did), first juice a white potato. Divide in into 4 small glasses, and leave one as is, while adding a bit of lemon juice to one, vitamin c powder to one, and one with both. Now just let them sit out on your counter and observe. The plain one will oxidize (turning brown) in no time, and you’ll be AMAZED at how long it takes the others to do the same. Hi! I’m new to your site – what a wholesome place! I’m also new to juicing and liked your suggestion of juicing by the gallon to consume over the next 4 days; otherwise I’m sure heaps of newbies will lapse. My question is : must it be stored in glass containers and why? will plastic bottles do? Thanks! Hello Lynn! Thanks for the nice comments – glad you like the FoodMASTERY site. Congratulations on taking steps to further educate yourself on nutrition and to start juicing. You can use plastic but we know that the sealable glass containers work best to protect the integrity of the enzyme quality of the juice. You can find sealable glass containers at The Container Store or place “sealable glass containers” in Google and you will find plenty of them online. Yes, newbies will juice 8 ounces and then have to clean the machine – does not work, unless you spend $2000 on a commercial unit that can be cleaned 1x every 24 hours. You must juice a gallon or more to make it worth the time spent using the smaller machines! Hope this helps and keep those questions coming! Everything I’ve read says that the juice should ideally be consumed within 20 minutes of juicing…..and if thats not possible it should be stored in foil wrapped containers for no more than 8 hours as the nutrients continue to deteriorate. Where did you get your information that it could be stored for 4 days? I agree….this would make it so much more convenient! Linda- great question. Here in Dallas, Whole Foods and Central Market sell the same juice (through a juice machine) and they place a 4 day expiration date on it. I have read the same material that you have and the way I interpret it is that from the very second the juice comes out of the machine the enzyme quality decreases by time and sunlight. It is NEVER a perfect world however. I have been juicing for years, making 1.5 gallon per juice run and have drank it up to four days without any challenges. My personal preference is that I’d rather drink 4 day old Bauer Power Green juice that any of that nasty stuff with sugar or preservatives in it. BTW, convenience is my middle name! You know what? You are so right! I get so caught up in it…..I get tangled! There is something to be said for convenience. I’.d like to try a juice fast…..but I think the only way I’ll accomplish that is if I juice ahead and store. Thanx for showing me the light! You are so welcome. The tangle is our humanity. We all have it – just need to manage it better. I know people, bless them, that have all the knowledge however never act upon it. Therefore they stay overweight and become susceptible to medication & illness. I often say: Don’t over-think the think … OVER-DO the DO! Keep me posted on your progress and let me know if you have any other questions! Thanks for the comments Mariëlle! Do you have a Greenstar? Those slow juciers seems to be well-built. Do they ever break? I don’t juice, I have a vitamix and usually make smoothies every day for my family. I always add some greens like kale, spinach, beets, lettuce. I haven’t tried with other veggies like carrots, celery, cucumber. Do you recommend ‘juicing’ over the vitamix? what are your thoughts? Hello Chantal. Interesting….this discussion come up all the time! The Vitamix is one of the best if not the best blending and all around machine out there. What you are doing is perfect and if you feel you are getting a great benefit (health, feel, leaning naturally, etc.) then I would not change a thing. My personal preference is the juice machine. My reason is that when I juice, I can DRINK a larger volume of vegetables that requires no digesting and that gives me an automatic assimilation into the bloodstream giving me more immediate benefit. In other words an 18 ounce comparable glass of green juice from my Jack LaLanne will give more enzyme benefit than 18 ounces from a Vitamix. Additionally, people say fiber this or fiber that… when you juice in the high volumes that I do daily, you do not need focus on fiber. With that being said, please note that I do not see this as a right way or wrong way. Just sharing my preference because you asked. The key is to not over-think all this stuff and keep whipping up the greens in the Vitammix and drink high volumes each day for maximum benefit. One of the followers here said she gets “tangled” up with all the over-thinking. I share this with people: Over-do the DO! Do juice as much greens as possible, fire up the alkalinity side of the ph scale and watch the body fat fall off. Only then will the degenerative diseases make a reversal and the medical community can take the day off! I’ve recently started “juicing” after purchasing the “Food Matters”. At the Moment I juice on a daily basis but wonder how often I should Juice. 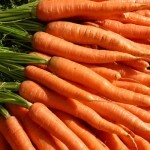 For example ,is Juicing replacing replacing meals or taken between meals. At present I take it late morning, then have lunch later. have you any recommendations? Hope this helps! To your extraordinary health! Thanks Chuck…I am looking towards a healthy body including weightloss of another 10kg. I usually make up approx 700ml a day and spread three glasses over mid morning, mid afternoon and one about 7pm. I feel better since I started taking the Juice a week ago. Hopefully this will improve even more over the coming weeks. Tom – congratulations on this effort. If you will do this consistently for 30 days…then stick with it for 3 months and make it a daily habit, you will achieve your health goals. Make sure to visit my other blog at http://www.facebook.com/foodmastery – make sure to look at my before and recent photos and take in the wealth of information on that site. Keep me posted on your progress! I have MS that is progressing rapidly. I’m going to start my 10 day juice fast today with your recipe given to me by a friend. I look forward to feeling better and being healthier by continuing to juice everyday. Wish me luck! I’ll keep you posted on my progress! Sandy – much beautiful thoughts and prayers for you as you undertake this journey. Congratulations on taking this huge step – a ten day juice fast will be a great first step! Make sure to take advantage of all the education that is here at http://www.foodmastery.net When you have MS or any other degenerative challenges, you must have a battle plan. This is a great place to start. Keep us posted on your progress and you can also use our blog at http://www.facebook.com/foodmastery to gather support for your journey! I’ve recently purchased the NurtiBullet. I also have the Jack Lalanne juicer. Great question and one that comes up frequently. First off, congratulations on juicing. So many people get “trapped” in details that they never take ANY action. Maybe afraid of getting healthy? Rarely do we come across someone with two different machines. My personal preference, based on juicing since 1998, is the “spinner” type of juicer, be it the Jack LaLanne, Breville or other. My main reason is simple: your extract virtually all the RAW juice, which contains the straight shot of enzymes, requiring no digesting. From the LaLanne or other spinning device, the juice is automatically assimilated directly into the bloodstream for INSTANT enzyme benefit. I have Fibromyalgia, arrhythmia, and depression. Hello are you out There…? Love the recipe. Long time juicer & big fan of your recipe. W holidays approaching & travel, I was thinking about making a double or triple recipe, & freezing some to travel with. What are your thoughts on freezing? Will it kill the nutrients? I was planning on letting it thaw/come to room temp naturally….no microwave or other heating mechanism. I am so happy I found your web site. I have a question about washing the vegetables. What type of water should I use. There has been so much controversy over distilled, spring, purified, and also what is the best water to drink? I am so excited about this web site. I have the Jack L juicer and I also have a vitamix and I must say I think I get the best results with the juicer, not taking away from my vitamix (my gift to myself after retiring). Thanks again for sharing all your knowlege about our health. The medical field need a vacation not just a day off…. I’m going to start juicing next week and my question to you is would the juice replace my meals? What else should I eat other than the juice? Congratulations Maria for taking additional steps on your weight loss and MS! Great questions – in the video I have a simple two step plan for you to start with! Plz click on http://www.facebook.com/foodmastery for more information! 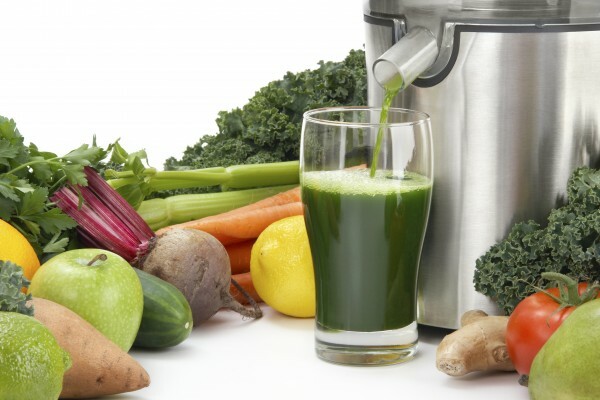 Follow Up – When you are juicing at high volumes each day – you are detoxing every day versus doing a “FAD” detox. Also, your body, based off of turbo charging your alkaline side of the PH scale, will L-E-A-N itself naturally, avoiding the pitfalls of supplements, lab band, surgery, oregano diets, cider diets, and false weight loss hope! Cory Cooley: Maria it sounds like you are HUNGRY FOR CHANGE and that is what it will take! when I started juicing about this time last year I weighed over 400 lbs! I have lost 170lbs to date and would have been more if there had not been a few months that I strayed from juicing! You will be amazed at how much better you feel and how fast your body will get to the weight it needs to be eating Raw green vegtables. If you have any questions please dont hesitate to ask becuase I had lots of questions for months after I started but Chuck told me to quit over thinking it and take action! At one point he even questioned just how coachable I was to get me going so I am glad you are “wanting” to make this change on your own that means you are already ahead of where I was starting! I think lord willing there will always be a juicer on my counter as long as I live and once you feel and see the results you will feel the same! Hi..great site !! Glad found it. I am 107 lb so don’t want to loose wt. How do I incorporate juicing in my diet ? Whether you are 107 or 1107 pounds, and wanting to lose weight or not, it is still at the highest level of importance to understand the power of the immune system and how the acid/alkaline affects the overall optimal health of your body. So, let’s answer your main question and then give you the global perspective of optimal health. Juicing and NOT losing weight certainly go hand-in-hand. My recommendation is to find a balance on how much green juice to drink in a 24 hr. period and maintain the weight you want and what your body wants. Try 24r-36 ounces per day and STICK with that for a minimum of 30 days and see what the results are. Then make adjustments. From a global perspective, you are in the minority! You do not have to deal with a weight challenge. However, you should always be concerned about PREVENTION of degenerative diseases and cancer. PREVENTION – a HUGE reason why you should be juicing everyday as a set DISCIPLINE! Example – the flu epidemic – HELLOoooooooooo . . . the flu is caused by everyone being acidic which causes a compromised and weakened immune system. They simply have nothing left over to fight the flu bug when they get it! Then what do they do? They resort to prescription drugs to treat it. A better bad choice! So here is a global perspective as it relates to juicing. Yes, weight is part of it. However, prevention of degenerative disease should be TOP-Of-MIND with everyone! When you juice using the green vegetables, and eat a whole food plant based diet you minimize the chances of getting degenerative diseases and turn from reactionary to prevention. Why? Because your body stays on the alkalinity side of the ph scale – thus BOOSTING the immune system naturally – giving you optimal health with drugs or silly mental band aids like lap band surgery. In my estimation, prevention is the key. Each day I see how social media is replete with post about people either battling cancer or have won the battle. However there is little to none promotion about PREVENTION of cancer. So…go forward and make juicing green organic vegetables part of your daily discipline. Do it every day FOREVER and do not come up with any excuses of why you can’t or not do it! You will benefit greatly from it and still maintain 107 pounds. Keeps us posted at foodmastery.net or facebook.com/foodmastery on your progress. I just bought a Ninja blender and have been pleased with it. It’s not in our budget to buy a juicer now, too… although eventually I do want to get one. Is there any way to adapt some of these recipes to a non-juicer? It’s very high-powered and breaks down the veggies and fruit well – but I don’t want to burn it out placing anything in there that a juicer can handle, but it can’t. Any help is appreciated! I just finished watching Hunger For Change and it was exactly what I needed to hear. After the death of my partner, I ate anything and everything dealing with my emotional state. Since then, I’ve seen a significant change in my way of life: no energy, no motivation, and just no self esteem. My birthday is this weekend so as a gift to myself, I am going to purchase a Jack L juicer from Costco. Because I have little knowledge of juicing but eager to Learn, do you have a receipt book you recommend or a site with different juicing options? And how many ounce should I consume a day? Yes, it’s that Danni. I have some questions. I did a 45 day juice fast and lost 30 lbs. I’ve taken a break and am going to do another fast. 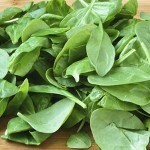 In regards to your recipe are the “bunches” of spinach natural bunches or the wrapped bunches in the store? I think my ratio might be off. Also, you say 6-8 bunches of celery. Is this stalks? Or bunches? When I started juicing the inevitable questions at work came so I explained what I was doing. Well, when I started losing weight everyone else started it! There are about a dozen people doing it here. I found out the other day I am referred to as the “Green Queen”. I’ve lost a few more pounds and I feel great. I juice four days a week. One benefit that I didn’t expect was how great my skin looks. It’s better than it has ever been and, at my age, that’s a true selling point! I am working hard at losing weight because i want to become a professional bodybuilder. I have changed my eating habits for the better and i heard about your juicing method but i guess my concern is losing muscle gains. While i am working on losing fat i’m afraid that if i cut out protein from lean meats and fish that i will lose the gains i worked hard at getting. Should i stop eating lean protein or can the two co-exist? I have both the vitamix and Jack LaLanne juicer…I love them both! I make green smoothies Monday, Wednesday and Fridays and green juice Tuesday, Thursday, and Saturdays. I would certainly like to consume more juice but I also heard it loses nutrients the longer it sits. From your opinion, juice a day or two old has a very high enzyme quality if stored in a glass jar with minimal oxygen? IF this is the case I can certainly see making a large amount and storing it…that would be wonderful! My main question is I also have two kids (6 & 4 years old) who I am trying to get to drink green smoothies and green juice. I add pineapple to my smoothies and juices to make them a bit sweeter so they will happily consume them. What do you think about this? Is there a better way to get children to want to drink these. Is the pineapple negating all the good from the juice and smoothies? Thanks so much for all the wonderful advice! The information contained in FoodMASTERY is provided for your general information only. It is not intended as a substitue for any treatment that may have been prescribed by your doctor. Chuck Bauer does not give medical advice or engage in the practice of medicine. Under no circumstances does Chuck Bauer recommend particular treatment for specific individuals, and he recommends in all cases that you consult your physician or a qualified practitioner before pursuing any course of treatment or making any changes to your diet or medication. © 2012 Chuck Bauer & Attitude Ventures, Inc. All Rights Reserved.